The aim of this action is the promotion of the port and its establishments as a shopping international center. To encourage this luxury tourism, and to improve the level of tourism in marbella, the Town hall has established a series of initiatives framed under the name of MARBELLA LUXURY WEEKEND. The action will be carried out between the 2nd and 5th of June and it includes the following initiatives. The initiative is being supported by different luxury sectors such as restaurants (Estrella Michelín), 5 star hotels and the best golf courses. The Town Hall of Marbella will run the whole organization, logistically and financially to convert Puerto Banús into a Shopping Theme Park. In order to obtain the best results, it is necessary the involvment of the different brands with establishments in Puerto Banús. The initiative is being supported by Guarnieri, which represents McLaren and Pagani, owners of shops in Puerto Banus, and Marina Marbella specialized in the commercialization of Luxury yachts. The Town hall of Marbella has enabled a specific department, in the Delegation of Tourism, to be in charge of the event coordination. The person in charge is Miss Otilia García Díaz-Ambrona (extranjeros@marbella.es, 952 77 14 42/619113127). Marbella Luxury Weekend's goal is to promote luxury products in the differentestablishments of big brands in Puerto Banús. The initiative is orientated to the "prospect" of the brands in the local, national and international area. Other touristic sectors such as gastronomy, 5 star hotels and best golf courses will shape an offer that is destined to turn Puerto Banus into an European reference of luxury products. The initiative will be developed in 4 days (Thursday to Sunday) in Puerto Jose Banús and its environment. This action will be similar to the ac tivity developed in the Avenue Montaigne inParis. 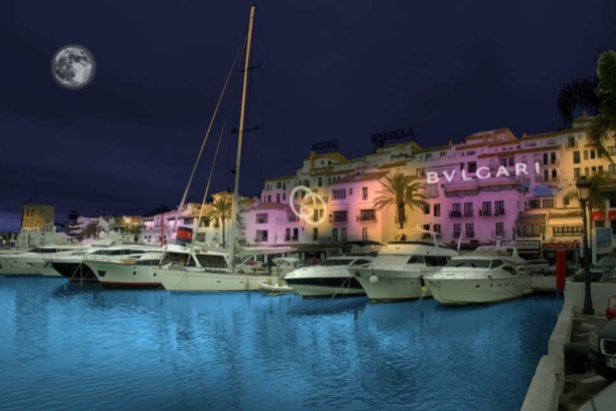 During the four days, there will be be a special setting of Puerto Banús with special lighting, decorative complementary elements, that will return the Port into a theme park of the luxury and the amusement. Along the four days there will develop festive activities outside the shops and two centers of social activity located next to Control Tower of the Port. A 30 m runway will be placed in the port, differents shops will show their collections and jewels to 400 VIP guests, the new "Mclaren" and "Pagani" (Guarnieri) will be placed there too, to show their new and most exclusive models. Every brand will be able to use the area of Club del Mar de Puerto Banús or, eventually, the Villa del Mar in the Marbella Club, to organize exclusive fashion shows to their best clients. The guests of major relevancy will have a special ship service between both centers in the Port. In addition to that, there will be yacht exposition and golf competitions. Have a look at the programme HERE!